We do more than just gardens! We are trained to design and solve problems in areas that occur outside the building walls. We do grading, drainage, pools and ponds, walls and fences, masonry, metal or wood construction, lighting, furnishings, pergolas, arbors, planting, cutting gardens, fire pits, putting greens, tennis, basketball and bocce courts, and even schematic designs for small buildings such as pool houses or pavilions. Katherine Field and Associates also designs custom furniture, stone carvings and sculptural elements for the landscape, and will find appropriate antique ornaments and sculpture. Our services include consulting on new building placement, septic system locations, identifying existing plant material, overall site evaluation, master planning, permitting, design development through construction drawings, cost estimating and phasing plans, bidding, construction phase administration, maintenance manuals, plant tagging, renderings and site models. We think working on a team with architects, engineers and interior designers results in the best possible project for our clients. 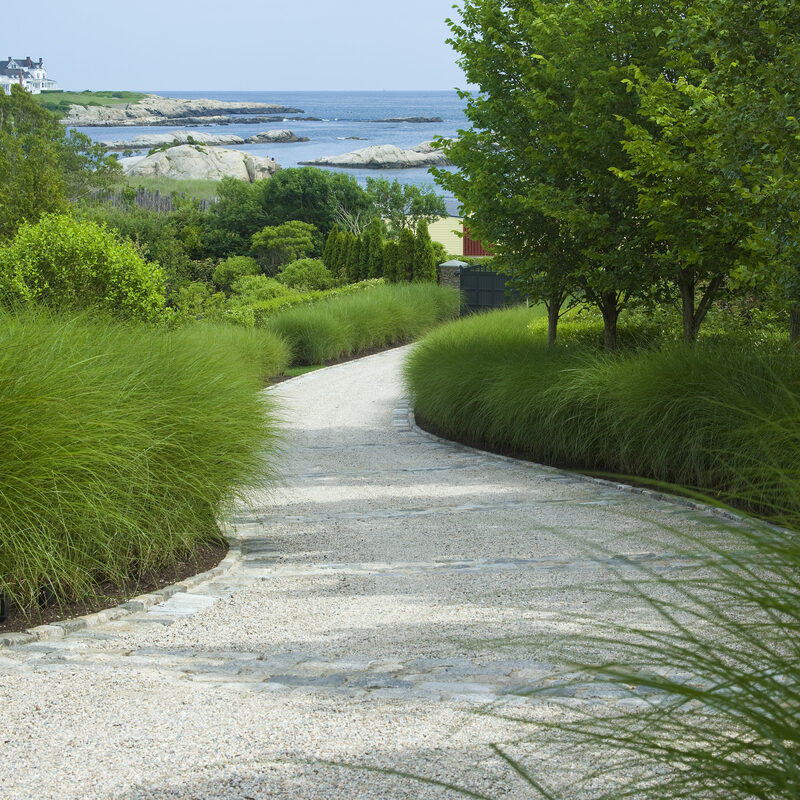 When should I hire a landscape architect? As soon as you think you might do any work on the house or property. A good team of design professionals, working together from the start of a project can save time and money. A landscape architect can consult with the architect or engineer in the beginning of a project without your having to get committed for a large estimate. It can also be the template for a phased construction schedule. Should I hire a landscape architect before completing the construction on my new home? Definitely! It is much better to get the input of a landscape architect before you have completed the architectural plans. Our perspective from the outside can really improve the building's relationship to the landscape. Should I go to the engineer for my septic design before hiring a landscape architect? Your landscape architect should review the location of the test pits before they are dug. Generally, the location of the test pits for the water table and perc tests will determine where the system must be located. This could have a huge and very negative impact on the landscape and gardens. And changing the location after approval can take months and be expensive. Who do I talk to about getting CRMC, DEM or DEP permits for construction? Work around sensitive environments such as coastal or wetlands must be done by licensed professionals such as a landscape architect or an engineer. How is the typical design process organized? The design process is typically divided into four phases which are laid out as follows. The objective of the first phase is to rapidly study a range of alternatives that begin to address project design and budget objectives. Ideas will be communicated through diagrammatic plans, elevations and concept sketches. We will assist you in determining possible cost implications of different design approaches and construction phasing options. Following your approval of the conceptual design and preliminary budget, we shall proceed with design development. Since the direction of the project will have been determined, key project components will be studied in greater depth. Through more detailed plans, the scope, character and quality of the project will be clearly defined. We will provide a more detailed cost estimate at the completion of this phase. Based on approval by the client of the Design Development Drawings, scope of work and estimated cost of construction, we shall prepare construction drawings, details and outline specifications. The purpose of the construction documents is 1) to communicate to both you and the contractor the intent of the Landscape Architectural design, in terms of quality, complexity, appearance and budget, and 2) to establish the basis of a contractual Agreement between you and the contractor for the construction of the project as defined by our scope of work. The extent of our involvement during the Construction Phase shall be determined based upon the complexity of the final design and the degree of drawing detail, interaction and coordination required by the General Contractor to proceed efficiently and effectively in a manner consistent with the design intent of the Construction Documents. We typically visit the project site at intervals appropriate to the nature of work, averaging one site visit every week or two. We will also review all contractors' Requests for Payments and Change Orders. What can I do as the client to expedite the process? What do you need from me? You can get copies of all plot plans, existing topographic surveys, deeds, and photograph the house and yard from all angles. In this day and age, we all work with digital files, but we can scan or digitize anything that is in the paper format. You can contact and hire a surveyor if there is no existing topographic and boundary survey. We offer surveying specifications as a guideline for being sure the right information is recorded so we can get started with our work. Meeting with the zoning officer in your town or city will help you understand what restrictions apply to your property such as setbacks, lot coverage, Historic District overlay, and height restrictions. As you begin to think about your garden and landscape, start a file of magazine 'rips' so that you can better define your style preferences and images of elements you wish to include in the plan. How long should we allow for the design process and construction of our landscape? It depends on the scope, contractor and permitting required. In a perfect world, we would determine the finish date and work backwards to find when to start. We generally like to begin the site work, hardscape, pools and structures in the fall so that there is mostly just the planting and finish work to complete in the spring. Ideally, and on large projects, we would begin the planning, permitting and design about a year and a half before completion of the construction. In order to start construction in the early fall and complete the following spring, we like to have drawings out to bid in the summer. Do you have your own construction crews? No. We are not a design-build firm. We work with many qualified landscape construction crews and believe that competitive bidding for construction is the smart approach. The money you save by getting a full set of drawings that can be bid will more than pay for our fees. We also believe that there is not one contractor for every type of project. We try to match the strengths and styles of our contractors with the needs of our clients. Since we have projects throughout metro Boston west and throughout southeastern New England and the Cape, we have a lot of contractors with whom we have worked and feel confident about recommending for your project. How much will I spend on fees? This will depend on your scope of work. An initial consultation or site visit will help us put together a proposal for our fees. We will always be able to give you either an estimate of the cost of our work where the scope of the project is undetermined, or an upset limit where we have a specific scope. Do you oversee the construction? Yes. However, we are not general contractors. We try to make all the decisions we can during the design process, but sometimes there are unforeseen factors that require design decisions during construction. We also review and authorize all requests for payment by the contractor. When should I plan to start building my pool if I want to swim in it next summer? Ideally you should plan in the summer before you want to swim, and get the contract with the pool builder in the early fall. The best schedule is to install the gunite shell and all the plumbing in the fall and complete the terrace and landscape in the spring. Where time is of the essence, it sometimes pays to tent over the pool area so work can continue throughout the winter. Can you help me with outdoor furniture? We not only specify and order outdoor furnishings including cushions and pillows, but we also design custom wood and granite furnishings for our clients. We carry a full line of outdoor fabrics for the cushions, umbrellas and pillows. Please note that some lines of furniture take 8-10 weeks to order. Does it make sense to build a permanent outdoor kitchen? That is a personal decision that depends on your space and your love of grilling!! We have designed many out door kitchen areas that accommodate a grill, sink, refrigerator, ice machine, wok and burner elements. Our biggest concern is making the kitchen blend in with the landscape. Can you help me with a maintenance schedule for my landscape? We encourage our clients to have a plan for the maintenance of their landscapes. We can help with seasonal task planning as well as the specific requirements for each plant. We do recommend that in order to fulfill the guarantees on materials and plants, the contractor who installed your landscape maintain the property for the first year. Is your expertise limited to just plants? No! We are a full-service design firm and planting design is one of the many things we do. We are like an architect, engineer, interior designer, horticulturalist, and artist all rolled up into one. But we love plants!! And have many years of experience designing with plants in many regions of the country. In addition to working with native plants and the full palette of trees, shrubs and ground covers, we are avid gardeners and familiar with perennials, roses, cutting flowers, annuals and bulbs. Can you help me with landscape lighting? Lighting can expand your enjoyment of the landscape. It not only provides safety and security illumination, but it can transform your landscape into a sculptural focal point.